Logo for Western Swing Fan Page on Facebook (all rights reserved; image used by permission). Western swing music was created by Milton Brown and made famous by Bob Wills. It is the first music genre indigeous to Texas. Western swing brought the steel guitar (by way of Hawaii) to country music - the steel guitar is one of the most distinctive and recognizable sounds in the genre. Western Swing also brought drums to the front of country music stages. The creators of this genre sought music that could compete with the big bands who controlled their music environment in the 1930's and 1940's: Tommy Dorsey, Duke Ellington, Count Basie, Glen Miller and others (hear some big band MP3 clips). In order for these country boys to compete they needed something fresh, yet still country to capture audience attention and also satisfy the more traditional established country market ... so the birth of Western Swing came. They took current tunes of the day, some old folk tunes, created some tunes of their own, wrote lyrics to instrumental pieces, added country, swing, blues, polka rhythms, and jazz to made an arrangement of music that just called dancers to the dance floors. Adding horns, accordions, standup bass, pianos, banjos, steel and electric guitars, and drums to the ever present fiddle of country music ... well, now that was something new and so the craze began that spread throughout the south and southwestern parts of the United States. Lasting from the 1930's on through the 1970's with many regional and local bands performing from the cafes and stages of historic dance halls of Texas, New Mexico, Oklahoma and as far west as California. Western swing music is infused with songs from many cultures. The Anglo-Saxon fiddle (or violin if you wish to call it), came to Texas from the British Isles; jazz, blues, and gospel from our African-American population; mariachi and conjunto from the Mexican people; the polka and waltz beat from our German and Czech ancestors; and the Cajun French Fiddle and accordion music from Louisiana. Perhaps because of it's multi-ethic origins, Texas Country music appeals to a wide variety of people from all generations, races and ethnic groups and is appreciated all over the world. This music, at least in the beginning, wasn't called Western swing. Some called it hillbilly, or old-time music, novelty hot dance, hot string band, cowboy jazz, and even Texas swing. Many of these bands adamantly refused the "hillbilly" name. The bands that performed the music preferred simply Western Music. Bob Wills (and others) thought the name "Western swing" was used for his music between 1939 and 1942 while his band was still in Tulsa, Oklahoma. There were ads in the newspapers in California that used the term "Western Swing Orchestra" for a night spot in April 1942. The first known use of the term in a national periodical was in Billboard Magazine on June 10, 1944 in connection with a write up about Spade Cooley. Some said that Spade coined the name as a play on Benny Goodman's reputation as the "King of Swing." After that the music once called Western became known as Western Swing. The Father of Western Swing: Milton Brown was born in Stephensville, Texas on September 8, 1903. While selling tobacco and singing in an amateur band, he met and joined Bob Wills and Herman Amspiger and formed a group that later became known as The Light Crust Dough Boys. Together they began putting together the music that later became know as Western swing. This was the first true Western swing band in that it had a standup bass, jazz piano , tenor banjo and twin fiddles. Milton was injured and died from injuries as a result of an automobile accident in 1936. The King of Western Swing: James Robert Wills (Bob) was born March 6, 1905 in Kosse, Texas. He learned to play the fiddle at the age of 10. Young Jim-Bobs father and grandfather taught him to play American Folk Music. He later learned blues and jazz from his black playmates who sang it in the cotton fields of Texas. He played the fiddle with the sound of blues and the swing of jazz. After Milton's death Bob kept the music going and he with pianist and vocalist Thomas (Tommy) Elmer Duncan put together The Texas Playboys and continued adding new concepts to the genre carrying it to national attention. There is a movement to get more youth involved in Western Swing performance, with the Bob Wills Swing School launched in July 2010 sponsored by the Bob Wills Foundation. Its aim is bringing more talented youth to the genre. Many bands such as Leon Rausch and The Texas Playboys, Billy Mata and the Texas Tradition's, Richard Helsley , and Bobby Flores and the Yellow Rose Band invite young talented musicians to join them on stage during performances. 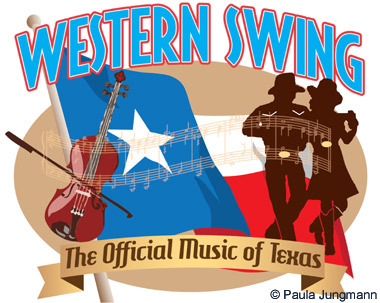 RESOLVED, That the 82nd Legislature of the State of Texas hereby designate western swing as the official State Music of Texas. Bob Wills - Your Friendly King of Western Swing album cover; photo by Stevesworldofphotos on Flickr (use permitted with attribution / no derivative works).